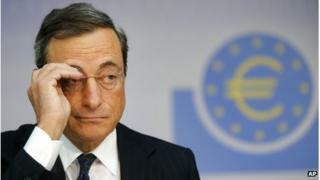 Economic recovery in the eurozone remains "weak, fragile, uneven", European Central Bank president Mario Draghi has said. He warned that further support for the banking sector could not be ruled out, and said that a protracted shutdown in Washington would harm global growth. Mr Draghi was speaking after the ECB kept its benchmark interest rate on hold at 0.5%. He said rates were likely to be left at this level for an "extended period". Mr Draghi said the ECB was "ready to consider all available instruments" to maintain financial stability and ensure that economic recovery in the eurozone takes hold. There has been speculation that the ECB might offer another round of cheap, long-term loans to banks to keep the cost of credit down. Recent economic data has indicated that the eurozone's economy is improving. Eurozone factory activity grew for the third month running in September, according to a survey. However, the ECB president said that bank lending to businesses was still weak, because of banks' reluctance to lend and also because of a reluctance by business to expand. "Credit flows are weak, I would say, very weak," Mr Draghi said. Continuing low interest rates were needed to support a fragile eurozone economy at a time when governments still needed to restructure their economies and cut excessive levels of debt, he said. The ECB's desire to keep interest rates low comes amid speculation over when the US Federal Reserve will start to scale back its economic stimulus programme. That has led to concerns that market rates will rise in Europe despite the record low ECB benchmark. Mr Draghi's comments that the ECB would consider all measures to maintain eurozone stability boosted the euro, which rose 0.6% against the dollar to $1.36, to a one-year high. The currency was also bolstered by news that Italian Prime Minister Enrico Letta had won a Senate confidence vote after a last-minute U-turn in his favour by former PM Silvio Berlusconi. Mr Draghi said that this week's US government shutdown would not help the global economic recovery if the crisis was "protracted". But he added: "The impression is that it won't be." When asked if he thought the US could default on some of its debt obligations in coming weeks, he said: "I don't".